Happy Friday everyone! What has everyone planned for the weekend? It's the run up to Christmas now and I am planning on trying to stay in and save for the festive period. I will be organised this year! The Michael Kors watch giveaway ends Sunday. There is still time to enter. You can see me wearing the watch again in some of the photos above. Great shirt! I love the spike details! Those jeans are a nice color, and they look super comfortable and lived-in. Also, love the pink watch! I love those jeans, they looks so comfortable! Great outfit! Love the details! Nice blog. That shirt is amazing doll! 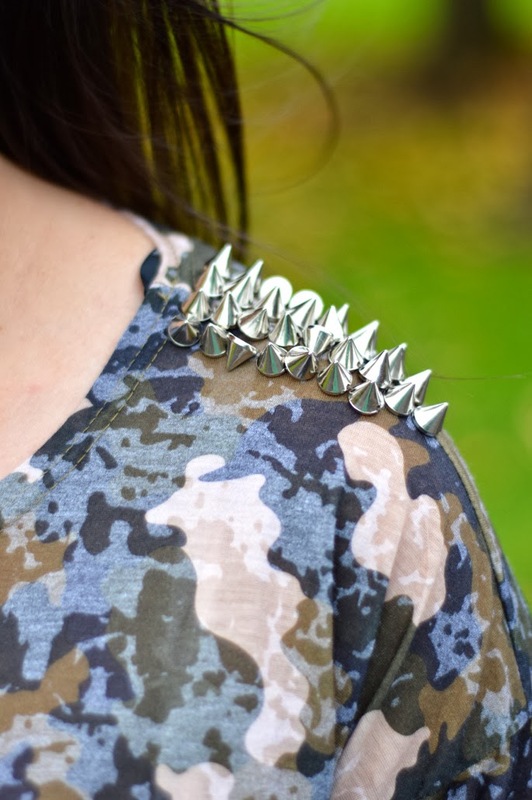 Beautiful cameo top and the touch of spikes adds a little punk to the look. I love distressed jeans. Would you like to follow each other on GFC, Bloglovin? I love the detailing on your top! Totally with ya on trying to save money. I am attempting no shopping until Black Friday! Ohhh nice shirt! It's like fancy camo...with spikes!